Go Elf Yourself on Kris-mas! December is here and it’s time for the Kreme’s Kris-mas to begin! New SINtendo! New Naughty Elves! New Temp Imps! New Konverations! Donnie the Demon returns! 12 new stories of the season from the Kreme! 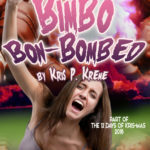 Get ready for the Twelve Days of Krismas, koming soon!